Since 1972, Brush Research has been manufacturing the original Flex-Hone® tool. Our flexible hone easily solves your deburring and surface finishing problems with a variety of abrasive types, grits and sizes available. 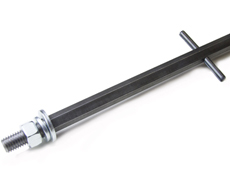 To address the varying deburring and finishing needs you might have, we offer both standard and heavy duty honing tool options. 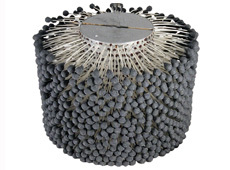 Due to its many benefits and excellent results, our flexible honing tool has become the industry standard. 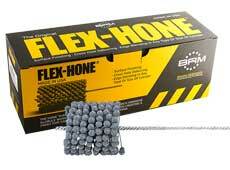 Download our Flex-Hone brochure to learn more about this powerful honing tool. 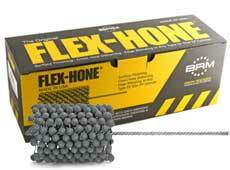 Want more information about the flex hone? Contact a distributor today. GBD 3" (76mm) 3" to 2 3/4"
GBD 3 1/4" (83mm) 3 1/4" to 3"
GBD 3 1/2" (89mm) 3 1/2" to 3"
GBD 3 3/4" (95mm) 3 3/4" to 3 1/4"
GBD 4" (101mm) 4" to 3 1/2"
GBD 4 1/4" (108mm) 4 1/4" to 3 3/4"
GBD 4 1/2" (114 mm)" 4 1/2" to 4"
GBD 5" (127 mm) 5" to 4 1/2"
GBD 5 1/2" (140 mm) 5 1/2" to 5"
GBD 6" (152mm) 6" to 5 1/2"
GBD 6 1/2" (165mm) 6 1/2" to 6"
GBD 7" (178 mm) 7" to 6 1/2"
GBD 7 1/2" (190mm) 7 1/2" to 7"
GBD 8" (203mm) 8" to 7 1/2"
Required drive shaft for GBD wood cores. Type SHAFT - GBDH 8" THRU GBD 10" SHAFT - GBD 10-1/2" THRU GBD 12" SHAFT - GBD 12-1/2" THRU GBD 14" SHAFT - GBD 15" THRU GBD 18"